As undergraduates in the Department of Middle Eastern and South Asian Studies examine the "Poetry of Gods and Kings" this fall, they are being led by Emory's first endowed Telugu professor — a sign of the university's ongoing commitment to scholarship exploring the rich culture, language and art of Telugu-speaking South India and its diaspora. "Poetry of Gods and Kings" is taught by Velcheru Narayana Rao, the first professor to hold the newly established Visweswara Rao and Sita Koppaka Professorship in Telugu Culture, Literature and History, endowed through the Koppaka Family Foundation. More than 80 million people speak Telugu — the second-most frequent of India's 22 national languages — and recent research on Telugu literature, religious traditions and history has expanded and shifted the study of Indian culture. The study of Telugu literature available in translation has already generated new interpretations of Indian historiography, pre-colonial modernity and social formations, Narayana Rao says. "Telugu has a thousand years of continuous literary production patronized by major kings and important individuals, beginning from the 11th century," he says. 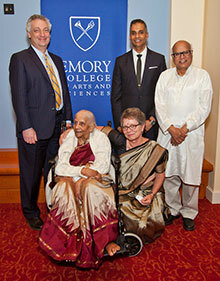 Emory is a major U.S. destination for the study of Indian languages, history, literature and cultures, and the new endowed professorship builds on that focus. "This is the first funded professorship for Telugu literature and culture anywhere in the world, outside the Andhra Pradesh and Telangana states of India where Telugu is spoken," explains Narayana Rao, who previously served as Visiting Distinguished Professor of South Asian Studies. 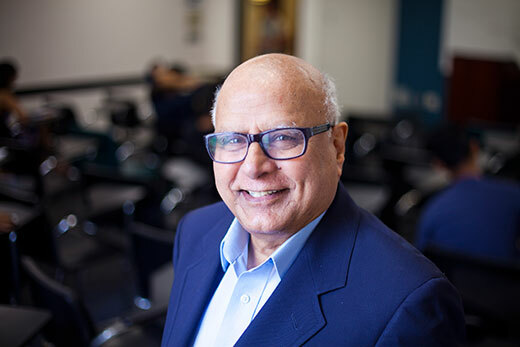 The new professorship "strengthens Emory's South Asian Studies program by bringing into primary focus a cultural area of India that has received less academic attention," Narayana Rao says, predicting Emory will emerge as the world's leading center for Telugu studies. Joyce Burkhalter Flueckiger, professor of religion, and her colleagues have been working towards this goal since 2007. "Initially, representatives of the Telugu Association of Metro Atlanta came to me to ask if Emory would be interested in a Telugu position if the community raised the monies. That set the ball rolling," she says. Fundraising efforts were slowed by the economic recession that began in 2008, but the Koppaka Family Foundation stepped forward to make the endowed professorship possible. "In spring 2008, Ram Koppaka reached out to me to ask about the goals and plans of the Telugu Initiative," Flueckiger recalls, "saying that the Koppaka Family Foundation was interested in the promotion of Telugu literature and arts, a longtime dream of their father Dr. Visweswara Rao Koppaka." The Koppaka Foundation first committed to half of the monies needed for an endowed professorship and ultimately made an additional commitment for the rest of the endowment. The creation of the Visweswara Rao and Sita Koppaka Professorship in Telugu Culture, Literature and History was announced last spring at an evening celebrating Telugu arts through performances of Telugu poetry recitation, Carnatic vocal music, and Kuchipudi dance, held at Emory's Schwartz Center for Performing Arts. Flueckiger praises the Koppaka family's "rare imagination for the value of education in the humanities" and for wanting to bring Telugu culture — including, for example, the study of poets such as Peddana, Annamayya and Potana — into the "mainstream" of an American university curriculum. "While we have a commitment for an endowed professorship, we now want to raise additional supporting funds to support this professorship and Emory's leadership in Telugu studies, including funds for graduate fellowships, lectures, performances and conferences," she notes.